Food has been a struggle for me the last couple months. After discovering that my body cannot process dairy during the completion of my month long vegan challenge back in June, it has not been easy for me to go dairy-free. Perhaps it seems a little counter-intuitive, but going vegan for a month was much easier than trying to be dairy-free for the last two months. In part, I think this may be because my month long vegan challenge was a personal choice and becoming dairy-free was a decision my body made for me. Food and I have been at odds since, fighting the dance of siblings as we bicker over what I should put on my plate. I do fairly well when I eat alone in the confines of my apartment, cooking up meals for one in a place where I can control the amount of dairy in the refrigerator and cupboards. The real struggle begins the moment I step out of my safe haven. Restaurants have become the enemy; an unwanted challenge as I sift my way through what I can eat and what I can't eat on the menu, feeling little more than an irritation as I ask the waitress pointed questions and make half a dozen omissions and substitutions from the list of entrees. I struggle with food because it puts my family in an awkward position as they try to make meals around my new disorder. My mother creates the most wonderful food—the vast majority of it made with dairy in one form or another—and I'm conflicted over asking her to leave it off the menu or keeping it on, since I don't want to deny anyone else the pleasures of her cooking. I struggle with food when my boyfriend casually suggests making macaroni and cheese for dinner, forgetting for a moment that I can't eat it, and making us both feel bad about the comment for different reasons—him, for making me remember my love for macaroni, and me, for refusing him a beloved food. I struggle with food because so many of my favorite foods are now forbidden. Just because I cannot eat milk, cream, or cheese, doesn't mean I stopped enjoying them. I have cravings for fettuccine Alfredo and rich chocolate ice cream that refuse to disappear, no matter how much I will them away. I struggle with food because I still want to share new and exciting desserts that are infused with cream and butter because, let's face it, cream and butter never stopped being delicious. In my own kitchen, I'll sometimes substitute margarine or alternative milks for recipes, but there are still occasions when I'll refuse to make pie without a buttery, flaky crust. 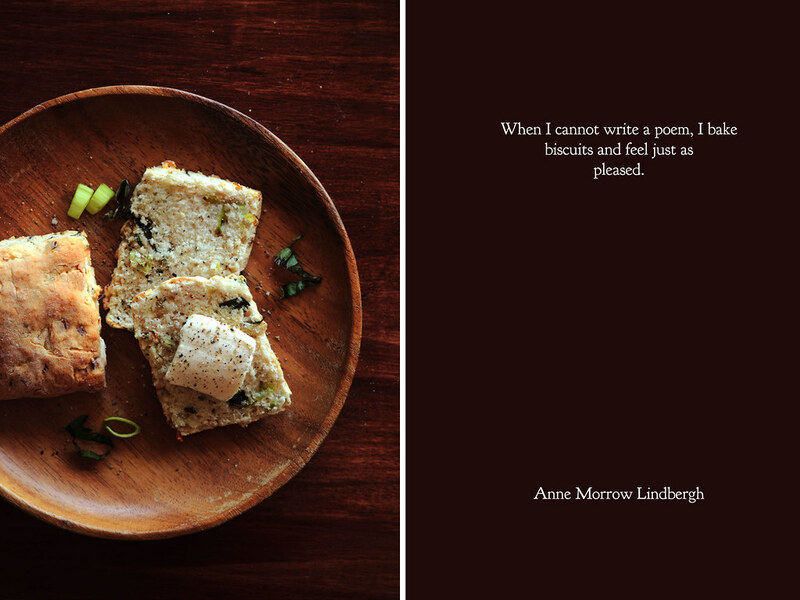 I'm continuing to juggle this new world of food, trying my best to create recipes that work for me and you. This journey has a long, long way to go, but I'm trying. Perhaps a little more time is all I really need. 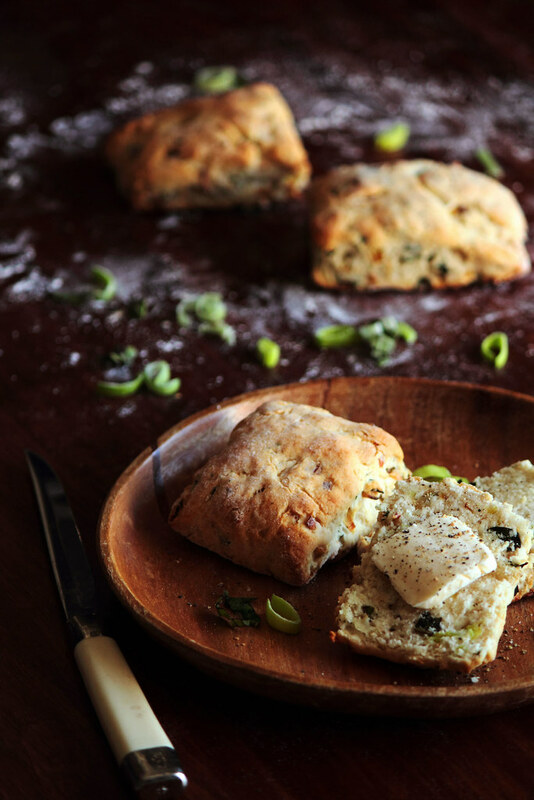 Caramelized Leek, Basil, & Black Pepper Biscuits are packed with flavor. 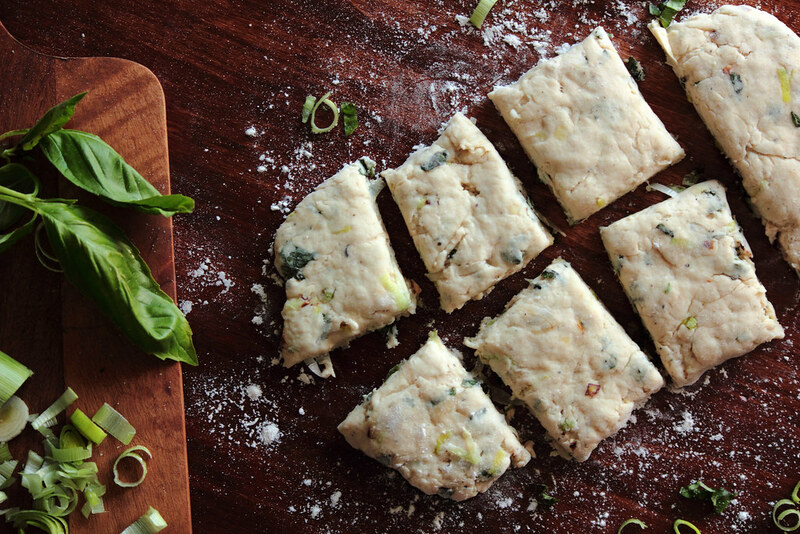 A basic biscuit dough is infused with freshly chopped basil leaves, caramelized leeks, and coarsely ground black pepper. While baking, the biscuits rise, becoming buttery and flaky. 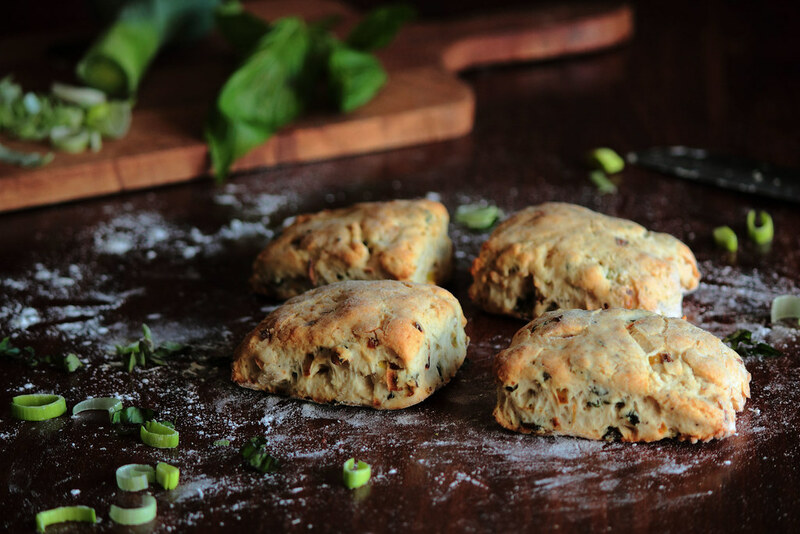 These biscuits make a wonderful side for a bowl of soup or casserole, but can stand alone for moments when a biscuit spread with a little butter is all you really need. 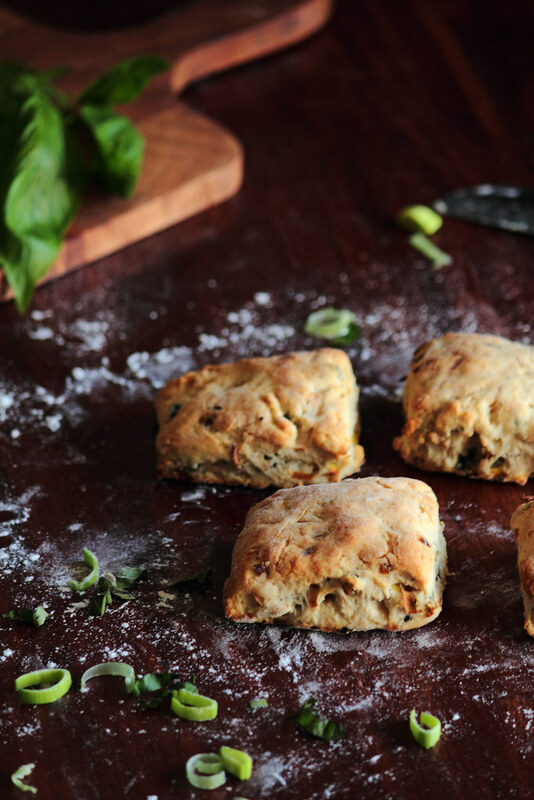 For tips on creating mile-high biscuits, check this out!